This month, I met Aaron Berhane in a Bloor street Starbucks and he told me how he had escaped his country’s secret police and lived to tell the tale. I still had the flu and I became progressively more feverish as he described starting out as a journalist in Eritrea, the small African country next to Ethiopia. I could feel myself sinking deeper and deeper into my hard-backed chair as if I was being driven into the ground by the moral force of his story. I couldn’t help putting myself in his position and wondering if I would show the same courage. Even as a little girl, I used to suspect myself of being a coward. Would I be brave enough to fire machine guns like Canadian soldiers in France? Or would I just run away? Some of my fears were triggered by the GI comics of the 1950’s. And the other part comes from within me: a nagging curiosity about the depths of my own courage or cowardice. Here’s Aaron’s tale: Aaron was one of the first graduates of the journalism and mass communications program in the University of Asmara, the capital of Eritrea. (This program has since been closed by the Eritrean government. It’s also worth noting that there are no privately owned media outlets in Eritrea.) After Eritrea got its independence in 1991, Aaron was critical of the way his government was running the country, but he couldn’t get his letters and articles published by the government owned newspaper, the only publication in the country. So he co-founded the first independent newspaper himself– over the objections of his father. He didn’t want Eritrea to become intolerant and repressive which is what he believes has happened to a number of African countries after their independence. The first issue of his weekly newspaper Setit was immediately sold out. Soon Aaron was publishing it twice a week and its circulation was 40,000. Such success was almost unheard of in a small country like Eritrea where about 60 per cent of its people are illiterate. However, several of the journalists on his newspaper are now being held incommunicado in shipping containers by the Eritrean dictatorship. 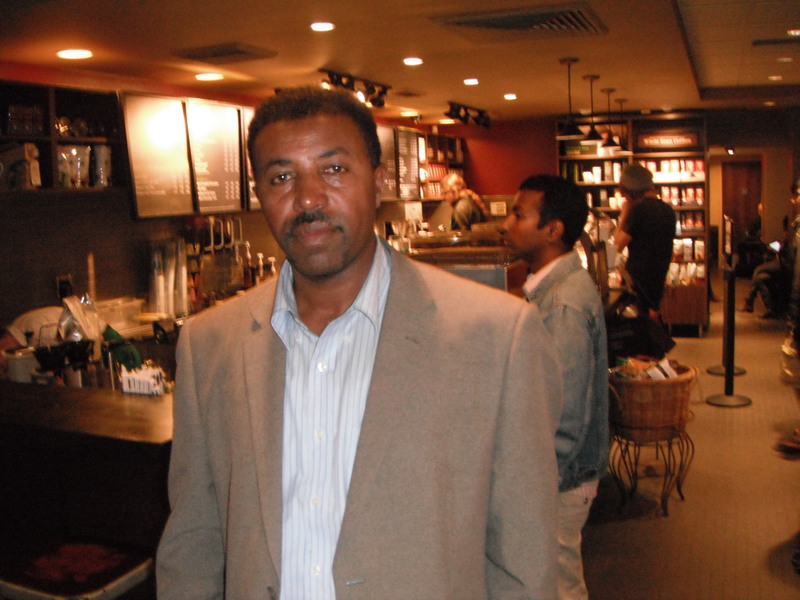 This month, PEN Canada published a letter of mine to the Eritrean government about one of them, Dawit Habtemichael (you can read this letter on the PEN Canada website http://www.pencanada.ca/programs/prison/eritrea-swan.php). Police surveillance of Aaron started after he published a letter by politicians criticizing the government for forcing Eritrea into the border war with Ethiopia. Immediately, police began bringing Aaron to the station for questioning. This went on for weeks, months. They usually questioned him the day before his newspaper went to press, thinking they could stop him from putting his paper to bed. Aaron says Isaias Afewerki, the president of Eritrea, was pulling his punches because he was aware that the world was watching. Then, after 9/11, the Eritrean government started arresting writers. They used 9/11 as an excuse, claiming they were hunting down terrorists. On Sept 23, 2001, police arrested dozens of journalists who had written critically about government policies. That same night, Aaron was staying at the house of a relative so he wasn’t at home when they came to take him. The police took his friend Mathewos, another editor, and Joshua, a journalist, as well as many of Aaron’s colleagues and co-workers, including Dawit Habtemichael. For 103 days, Aaron hid in a room no larger than a cupboard. He was determined not to get caught. But there was no easy way to flee. His picture was everywhere and he needed a permit to travel from one city to another. So he forged his ID, put gray in his hair and started out with a guide and some colleagues in a borrowed car. Somehow they managed to cross the check points on their way out of Asmara. In a matter of hours, they were at the border. Their guide told them that the border guards took a break around 11 p.m. so Aaron and his friends ditched their car in a village and started out on foot. But the border guards came back early from their break. As Aaron and his friends crossed the border, soldiers started to shout from every direction. Aaron and his friends split into two groups. The soldiers opened fire, and Aaron ran as never before, jumping bushes and ignoring the pain from their thorns. He fell down and dropped his backpack which had $5000 US dollars sewn into the bag and he didn’t stop to pick it up. There was no way he could find it in the darkness anyway. He could hear gunfire near him and gunfire farther away, where he imagined his friends were running. He ran for two hours before the shooting stopped. He was alone in the dessert and he had to get into Sudan before sunrise or the Sudanese police would arrest him. He made it to Kesela, a border town. He had one thousand US dollars in his pocket. He shaved his beard and dressed like a Sudanese, in a flowing coat and small cap. When he went to the United Nations High Commission for Refugees, he was told that he had been listed as one of the journalists arrested in Eritrea. He had to prove his identity before the UNHCR would help him. So he wrote to NGO agencies including PEN International. PEN International wrote him a supporting letter confirming his identity, and the UNHCR helped him get travel documents to Kenya. Then he immigrated to Canada because Canada took only three months to process his application; the US was known for taking longer. Now he runs a weekly newspaper in Toronto, which is published in English and in Tigrigna, the language of Eritrea. Two years ago, Aaron’s family joined him. Aaron’s friends haven’t been so lucky. Joshua died in jail and the others are still imprisoned by the Eritrean government. Anyone who wants to help can get in touch with PEN Canada who is running a special campaign on their behalf this month. Visit http://www.pencanada.ca or email Brendan de Caires bdecaires@pencanada.ca and Brendan will tell you what to do. And by the way, my flu is over, and I still wonder how I’d react if I’d been in Aaron’s situation.